The Forth Ferry has been sailing between Anstruther and North Berwick since June, and we’d been meaning to do the trip with the kids all Summer. So, we decided it would be a great family day out on the last day of the summer holidays. Well, we couldn’t have been luckier with the weather; last Tues was one of the hottest days of the summer! The kids watched excitedly from Anstruther harbour as the ferry arrived from North Berwick full of passengers waiting to explore the East Neuk. Lots of them had brought bikes; a perfect way to explore the area for the day. Once we were all on board and welcomed by the crew, we set off (at reasonable speed!). Don’t forget to pack extra layers though, it does get cold…even on a beautiful day! As we approached North Berwick, there was a real sense of reaching our holiday destination. It’s a real magnet for visitors and, as we pulled into the harbour, it’s clear to see why. It was buzzing with visitors (lots of foreign tongues) and the harbour is a lovely place to sit and while away the afternoon. If you love seafood, I would recommend the Lobster Shack at the harbour for an al fresco lunch. It has a great menu including lobster (obviously), sea bass and prawn cocktail and the food looked amazing. Because it was such a nice day, we had packed a picnic, which we enjoyed sitting by the harbour watching the world go by. After lunch the kids were eager to visit the Seabird Centre, just up the steps from the harbour. They had great fun and especially loved playing with the interactive live cameras, zooming in on all the wildlife. Did you know Bass Rock has the world’s largest colony of Northern gannets and is BBC Countryfile Magazine’s Nature Reserve of the Year! Another highlight was the telescope on the upper floor and the 3D film. If you’re visiting, there’s a lovely café where you can enjoy lunch or coffee. They have a great selection of home bakes. Afterwards we headed towards the beach, which was packed with people sunbathing and kids playing in the outdoor pool area. Such a pity we don’t get more days like that to enjoy our stunning coastline and beaches! We then headed into the town centre and shortly came across a quaint, old-fashioned sweetie shop selling award-winning ice-cream. Well it was such a hot day and we couldn’t resist!! The kids also enjoyed choosing some sweets from the many jars lining the shelves for the boat journey back. We didn’t have much time left before the ferry, so we strolled back along the beach towards the harbour. We had time for a wee seat in the sun, while the boys enjoyed climbing over the rocks and watching kids jumping in at the pier. Our return ferry was at 4.30pm. We only had 3 hours in North Berwick and we really wished we could have stayed longer as there’s loads more to do. On boarding the ferry, we were advised the wind had got up and passengers sitting on the right (that was us!!) may get wet! My husband and I decided to move under cover, but the kids were feeling brave and stayed put! We set off and the hoods were shortly up to avoid the continual spray from the waves! Shortly our eldest son decided it was time to move under cover. Our youngest son, however, couldn’t be happier getting wet! To finish off our day we couldn’t leave Anstruther without having fish and chips! What an amazing day…perfect weather, fantastic boat trip, new adventures and special family memories. 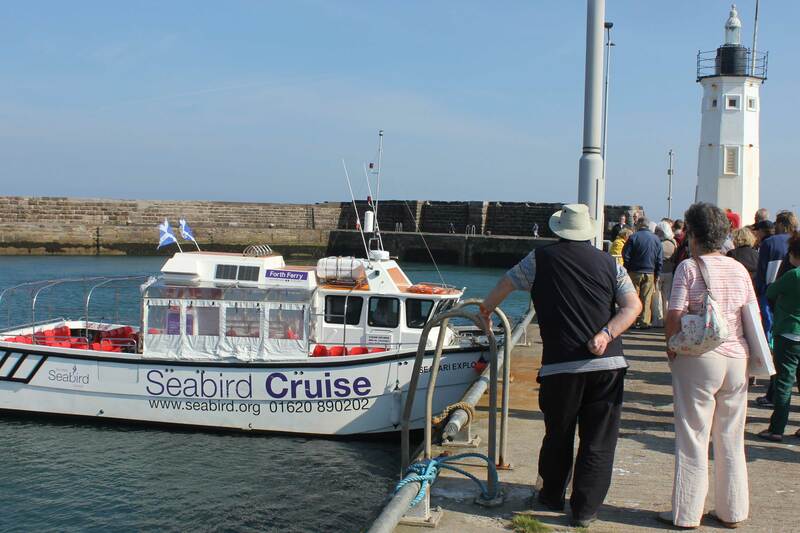 I would recommend taking the ferry; it’s a great way to travel to North Berwick, much faster than by car and the kids will love it. We’ll definitely return next Summer when the ferry is running again to do all the things we didn’t have time to do this trip! Walk part of the Fife Coastal Path, stop off at Billowness beach or check out the Caiplie Caves near Crail. The East Neuk is also perfect for exploring by bike. Bring the golf clubs and play in the Home of Golf. Anstruther golf course boasts no 5 (The Rockies), voted the hardest par 3 in the UK! Don’t forget to check out the Fife digital kiosk at Anstruther harbour for more inspiration and things to do. For information on the Forth Ferry and sailing times, click here.